Whether you’re dropping hints to your kids or helping your youngster create a Mother’s Day craft for grandma, practical yet personalized gifts make the perfect present. From monogram coffee mugs to thumbprint tea cups, we’ve got step-by-step instructions and ideas for homemade Mother’s Day mug crafts. In a style that would make even Martha Stewart proud, elegant dots and monogrammed letters create a stylish and unique Mother’s Day gift that will remind your mom she’s loved all year long. Lightly dip a round stamp or something with a circular end into the color of your choice and stamp porcelain paint dots in a random pattern all over your coffee mug. Allow to dry completely. 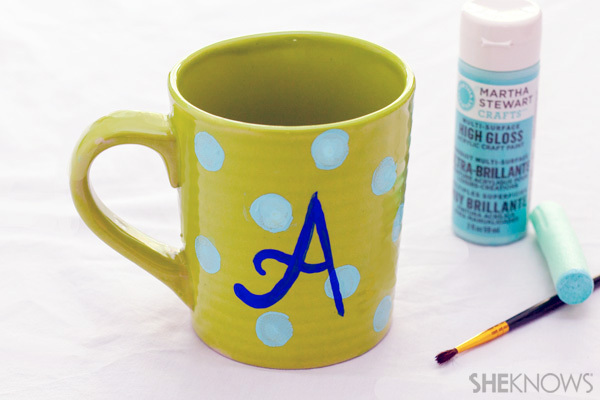 Using a darker color and a paint brush, paint on the first letter of your mom’s name on one side of the Mother’s Day mug. Allow to dry. Follow the directions on the back of the paint container to cure. Typically you’ll bake your creation in the oven at 350 degrees F for 30 minutes and allow to cool completely. Be sure to follow the instructions on the paint bottle carefully to preserve your homemade Mother’s Day craft forever! When it comes to crafts for kids, perfection isn’t always the goal. 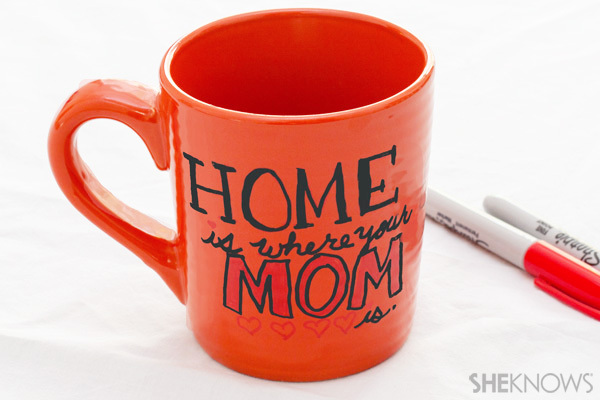 With a handful of permanent markers and your youngster’s creativity, a freehand drawing on a Mother’s Day mug becomes a work of art to be cherished for years to come. Like with any crafts for kids, they may need a little assistance. Help pop open the caps on several colors of permanent marker and let your youngster go to town creating a one-of-a-kind drawing for Mother’s Day. 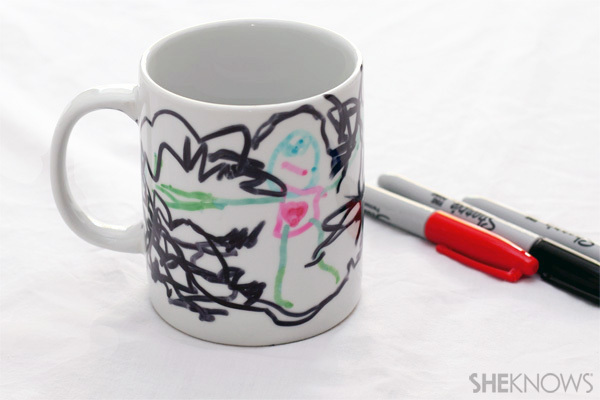 Place the decorated coffee cup in the oven at 350 degrees F for 30 minutes, cool completely and gift this unique Mother’s Day craft to grandma — or keep it for yourself! 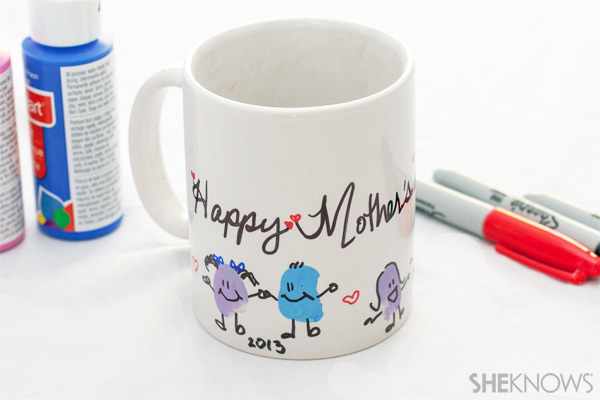 Make your mom smile each and every morning — even when you’re not there to do it in person — by scribing a personalized homemade Mother’s Day message on her coffee mug! Using your permanent marker, help your kiddos write a personalized message to grandma or the special mom in your life. Bake the mug in the oven for 30 minutes at 350 degrees F and allow to cool. Don’t forget to hand wash only, for a simple Mother’s Day craft that packs a big sentimental punch all year long! You may be used to your child’s fingerprints all over the house, but you can put those characteristic patterns to good use when you use them to create homemade Mother’s Day crafts that are as unique as your youngster’s thumbprint. With a clean cup in hand, carefully dip your child’s thumb into the paint — coating well — and press against the mug to create a thumbprint. Allow to dry. Using your permanent marker, create eyes, arms and legs on the thumbprint. Help write your child’s name and age under the appropriate thumbprint. Add a special Mother’s Day message to your craft. Place your Mother’s Day craft for kids in the oven at 350 degrees F for 30 minutes and allow to cool completely. Don’t forget to hand wash to preserve your child’s sweet thumbprints for the life of the mug.